Earlier last week, my father gave me a call about his central locking remote key fob for his Toyota Camry not working. As it was the remote he was using as the primary remote, the appropriate assumption would be that the battery had run out especially as the range had decreased and the battery had never been replaced within the lifetime of ownership of the car. Thinking it would be a hassle free task, as it usually is with most remote key fobs, I instructed him to take it apart, examine the type of battery and replace it himself. Batteries are known consumable items, and many remotes are made to come apart either via taking out some screws, or by prying at the seams where they would unclip. Inside, you’ll probably find some odd 12v cell (e.g. the A23) or some other lithium cell. Imagine my surprise when I got a call back claiming that the remote wouldn’t open by conventional means, and was only cracked apart once subjected to the heavy blow of a mallet. Further to that, the battery appeared to be welded into place. Hmm. Later on, it was also discovered that the manual claimed that the remote was not to be opened. Doesn’t sound very user-friendly to me! I deemed it a job which required my intervention, which resulted in a visit from my father today. When starting the job, all I got were some blurry photos of the items. Granted, these are relatively small, and the cameras in low-end phones really don’t do it justice, so I’ve taken some high resolution shots once the pieces had arrived. Given its age, it’s not surprising that the rubber button had disintegrated into pieces. Inside, there was one circuit board, and the outer shell split into two halves. This outer shell seemed pretty sturdily glued at the seams. Given this appearance, it really does seem that the items were made “disposable”, so you would be forced back to the dealership to acquire another remote, possibly at a significant cost. After all, the eBay guys seem to want AU$11 for a new rubber button insert, and AU$80 and upwards for a new remote. I’d hate to think what a dealership would have charged. The top side shows two ICs, one ST and one unknown, but both seem “purpose specific” for this remote. The push button, a few caps, resistors and scrap rubber can be seen. On the rear side, indeed, a tabbed, spot-welded CR2032 cell can be seen with “opposing” legs. The original is a Toshiba cell, made in Japan, with the main PCB dated Week 19 of 2001, making this more or less 15 years old. That’s a pretty robust cell to have lasted this long. There is also a drill hole that has cut into a bit of copper – this is likely to be a tuning inductor where the drill hole is precisely controlled to ensure the output frequency and shape is within acceptable limits. Given this discovery of a tabbed cell, replacement is not as simple as “popping a new cell in”. They could have mounted a socket, which would have made the remote a hair thicker, and saved all of this mess but I suspect they saw this as a way to improve the robustness against dropping the remote and improve their “customer return” profits in service calls. Given a car well outlives the lifetime of a lithium cell, this doesn’t seem like a sensible engineering choice, but it’s also one that’s fairly easy to remedy. Knowing the cell configuration, I went hunting on element14 and found the right configuration almost immediately – and it was on special for AU$1.18. Bingo. I ordered it and picked it up ahead of time so I could do the replacement immediately when the remote arrived. The particular cell chosen is a Panasonic CR2032 cell with 220mAh capacity, made in Indonesia, catalog number 1298246 on element14 (+01 at the end when on discount). Most other options with PCB pin mounting have two pins on the positive side, which is not quite the right configuration, but you might get away with cutting one of the pins off and bending the other one to meet the dimensional requirements. Other than that, of course, you will need a soldering iron, some soldering skill, good desoldering braid and some solder. When doing the replacement, I tried to work as fast as I could, as rolling code remotes reset their sequence when they lose their battery supply. I figured that the battery likely feeds an input capacitor due to the pulse nature of the consumption, and that gives probably a few tens of seconds to replace the battery without losing the sequence. As a result, I concentrated on the repair, rather than taking photos, but once done, it looked like this. Some flux residue was left on the PCB, but no big mess there. The excess leg length was trimmed. The old cell is seen to the side. The new cell fits like a glove and the case can close just fine. I marked the polarity of the battery with green marker on the PCB (only colour I had at hand) just for safety. I suppose, to no great surprise, right out of the repair, the remote didn’t do anything. The car just didn’t recognise it anymore, meaning it had lost synchronization with the receiver. Luckily, I had asked my Dad to bring the manual for the car, as I was certain I saw the resynchronization procedure in the manual, and it turned out to be a simple one (as compared to some of the similar models of the time requiring door opens and closes in a voodoo magic kind of sequence). For this car, it was as simple as opening the door, sticking the key in, turning it to on, pressing the remote button that it didn’t recognize, hearing the car honk and flash its blinkers to signify it had accepted the remote, and then turning the key back into the off position and removing it. After that, I did a little extra work with plastic from an SD card case to make a little button shield to stop dust entering the case while leaving the button free for access through a hole, and then superglued the halves together. Job done. Things don’t have to go to waste, and fixes don’t have to cost very much time or money as long as you’re well prepared and do your homework. It’s very interesting to see this kind of engineering design choice, as a socketed CR2032 would have been to the delight of the consumer making it easy to service, and a screw-closed case would be equally as robust. Given the simple resynchronization procedures and the fact it is in the manual, even having the cell pop out because of an occasional drop and needed to be clicked back in is no great disaster – good shell design with a bit of support to prop the battery into the socket would probably be enough to stop that. As a result, I can’t seem to see any great reason why the design was made this way, except probably to force people to go back to the dealer for a “new remote” to replace their dead one when all that needed changing was an AU$1.18 part. 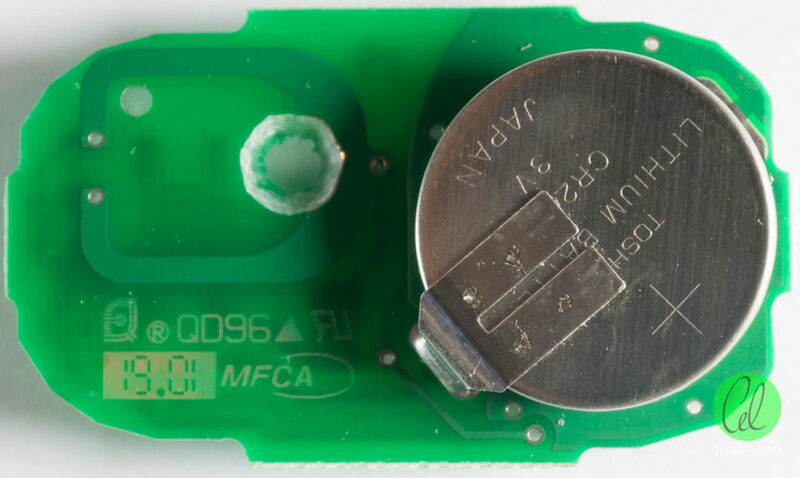 This entry was posted in DIY, Electronics and tagged battery, repair, teardown. Bookmark the permalink. I have to say my 2000 Honda Insight fob is a much better design. Removable battery, via a circular door you twist with a coin to open, and hard plastic buttons buttons instead of rubber. It has taken a beating these last 15 years I have owned it and it still works. The car came with two fobs and I bought two spares (cheap) on eBay back in 2002 since I thought for sure they would break after about two to three years of use. Surprised that I am still on the first one. My 78 year old mothers 2007 Nissan Versa fob has rubber buttons that are now sticky and are probably going to deteriorate within two to three years. It appears the design flaws are not strictly Toyota. Agreed – hard plastic is much more durable, and user replaceable is much more convenient. Interesting to note the variations even between major manufacturers. Thanks for this post. You have prompted me to the same course of action. I´ll be honest with you, your website was the only that i found that gives clear instructions and info regarding this issue. As stupid as it might seam, i havent been able to pop open the remote, i have been trying to do it with a very sharp and just can´t. is there any trick i might be missing. If you have access to a vice, you can try squeezing it until it pops. Prying around the edge with some thin flat-blade screwdriver or “spudger” might work as well. I don’t really have any real tricks – it usually boils down to brute force. Thanks mate, i’ll give it a go! You saved my central locking remote thanks dude! N15 Nissan Pulsar has the exact same remote, i ordered the same battery as you and it actually didnt work so i gave up, then 6 hours later it magically worked haha!